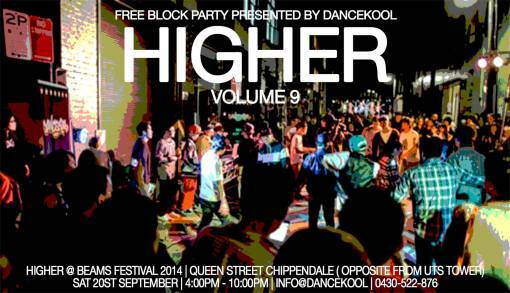 Higher Vol.9 @ Beams Block Party Sat 20th September 14′ | SOUL OF SYDNEY FEEL-GOOD FUNK SOUL DISCO vibes & beyond. the 2V2 allstyle Battle FEATURING our special guest judge BROOKLYN TERRY (ELITE FORCE)!!! Dancekool is taking Hip Hop (STREET DANCE) dance culture to the streets, creating a vibe that is raw and infectious to Beams Festival goers with Real Music, Real Styles and Real Hip Hop. So stop by the party and get a glimpse of what an old school block party feels like!